After discussing, saving, and preparing, we have decided to set off on an 8-month Round The World Tour. Our itinerary covers Hong Kong, Taiwan, Japan, Europe, Canada, USA, Canada again, and Australia. Our choices of countries evolved and grew over a period of about a year. 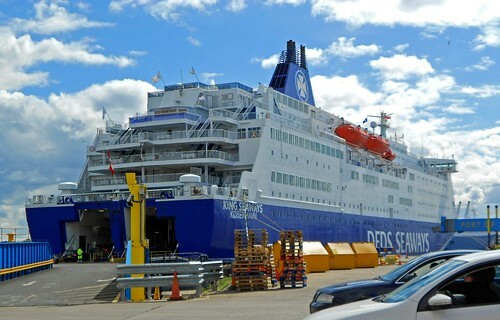 The first idea was that we would take 2-3 months and do the North Sea Route. Then we wanted to include France in that plan. And I got the idea in my head that I wanted to spend Christmas with my family in Canada. While we were discussing these ideas, Rowan mentioned he'd like to go to South America too. So Rowan started looking at what was involved with purchasing and using a Round The World airline ticket. The world, according to the Round The World ticket organisation we went with, is divided into zones. We were allowed a limited number of flights/stops in each zone, and we could only move forward in the direction we chose. We were also limited by weather/seasons, and my desire to be in Canada by Christmas. With those limitations in mind, we started picking places in each zone ... and after narrowing and reworking our list of places we would like to visit, we came up with our finalised itinerary. Several places were dropped from the list because we just couldn't fit them in. But they are on the list for future tours ... some of the places that didn't make the cut this time include New Zealand, Peru, and the Canadian Maritimes. I have started the UK report below, and will link to the other segments as we go. Wednesday 11 July - We were up very early and down in the airport ready to go before the check-in people arrived. However, when we did line up to check in, the process of checking in the bicycle boxes took so long, that when we got through and almost jogged to the boarding gate, they were just starting boarding. I don't like feeling rushed like that. Some airlines charge for the bicycles, and some don't. We knew that when we booked everything, so we were prepared to pay for the bicycles when flying with Cathay Pacific and Japan Airlines. Fortunately Qantas doesn't charge for bicycles, and I think some other airlines we're using don't either. The first leg of the journey took us to Tokyo. Unfortunately, we were only there long enough to change planes and go. Maybe next time we'll have the chance to see a bit of Tokyo. And then we had a 12 hour flight to London, over Russia. Long day! We landed late in the afternoon, collected our baggage, and made our way to the train. This is the most difficult part of arriving in London. We can take the bicycles on a cart all the way to the point where we have to pass through the ticket gates to catch the train. Then it's all lifting and carrying. And with two large bicycle boxes, plus panniers etc., it's a bit of work. And we are not allowed to take unboxed bicycles on the train out of Heathrow, so we can't build the bicycles and use them to wheel our panniers. If you know of a quicker and easier way to make an entrance into London, we'd like to hear about it. We've done this twice now (2007 and 2012) and it's a pain. Nevertheless, we arrived at Earl's Court in due course, and I was not feeling particularly well just then. Rowan said I looked quite white and I was shaking. I'm not sure why. Maybe it had just been a really long, long flight and I was tired and hungry. Because the hostel is a little ways away from the train station (about 1 km), we opted to build the bicycles on the train platform. That was fine, but it did attract some attention. One of the concerns was that we might be tempted to hop on the train with the built bicycles, and that is not allowed on the Picadilly line. You can take built bicycles on certain lines, but not all. The bicycle build process didn't take too long, and we were soon in Earl's Court on the way to the hostel. We got into our room ... and stayed there the rest of the day and long into the next morning. Gotta love jetlag! 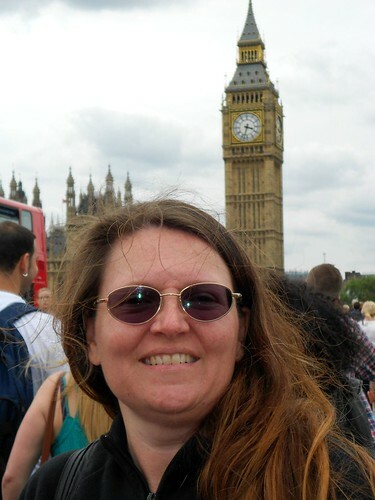 Thursday 12 July - Later in the morning, over breakfast, we decided to do a bus tour of London. The last time we were in London, we just took the train and saw a small handful of sights. This time we decided to take a more formal tour and see a larger number of places. It would also allow us to ride the bus rather than doing a lot of walking. 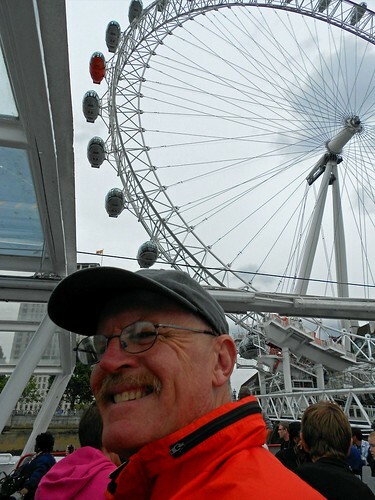 There are some good bus tours, and the one we chose also included a free (or included in the price) cruise on the Thames. It was a hop-on-hop-off tour which allowed us to leave or join the tour as desired. One section of the tour provided recorded commentary, while the rest of the tour provided live commentary which was quite good and informative. We learned, for example, where the term "Daylight Robbery" comes from. 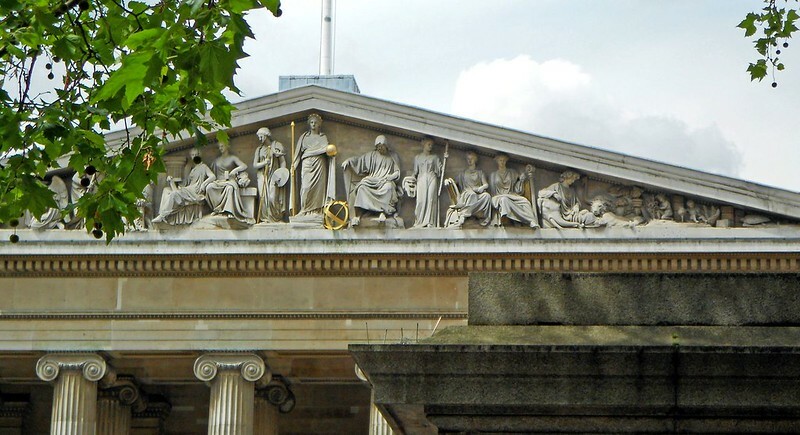 And we learned the identity and location of many interesting buildings, statues, monuments, and areas of London. The tours took a lot longer than we imaged and we were finally back in Earl's Court about 9 pm. Friday 13 July - We thought we might like to stay in London an extra day, but the Earl's Court hostel was very busy and didn't have a single spare bed for the night. So we decided to move on to Edinburgh. Rowan did quite a bit of research last night on which trains we could use to get to Edinburgh. While we could not take the Picadilly line with the built (unboxed) bicycles, we could take the District line, and then change to the Circle line to get to Kings Cross. At Kings Cross we could book a train to Edinburgh. So that's what we did. And it all went relatively smoothly. Of course, our train on the Circle line stopped and service was cancelled one stop from Kings Cross, but that's only to be expected on British Underground. And fortunately this time, there was another train right behind which was able to take us to Kings Cross. I'll be interested to hear how the British Underground holds up during the Olympics. It is notorious for suddenly cancelling service and leaving passengers stranded on the platform. Once at Kings Cross we were able to book a ticket on a train leaving in 9 minutes. It was a bit of a dash to the platform, a quick loading of the bicycles onto the last car way at the end of the train, and then a leap onto the train with our panniers moments before it pulled out of the station. We had a really nice, comfortable trip up to Edinburgh and got to see some of the English and then Scottish countryside. Toward the end of the journey we were travelling right along the ocean ... a very cold-looking ocean. Neither of us had ever been to Edinburgh, and we didn't know what to expect when we emerged from the train station. I was expecting something similar to London, but it's quite different. 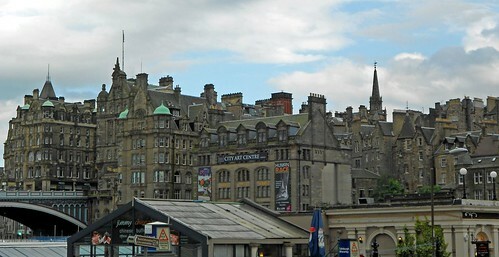 London looks old and historic, but Edinburgh looks even older and more historic. And while London is crowded with very narrow streets, Edinburgh seems more open and spread out which is good or it could feel somewhat overwhelming. I will try to post photos to show you what I mean because it is a little bit hard to describe. Imagine lots and lots and lots of old grey stone buildings. They all look centuries old, but apparently there is a new town and an old town. The new town is probably only a couple hundred years old, while the old town is much older. We were able to get a nice private room in the first hostel we tried. We had a good dinner in the hostel restaurant, and were able to purchase a USB dongle which will allow us to gain more regular internet access as we travel around the UK. We're hoping it will work in Europe as well, but we'll see. Saturday 14 July - We have booked several nights at this hostel for a couple reasons: 1) Both of us are recovering from a cold/flu and we hope this will be a good chance to get some rest in a comfortable environment; 2) We really wanted to see something of Edinburgh. 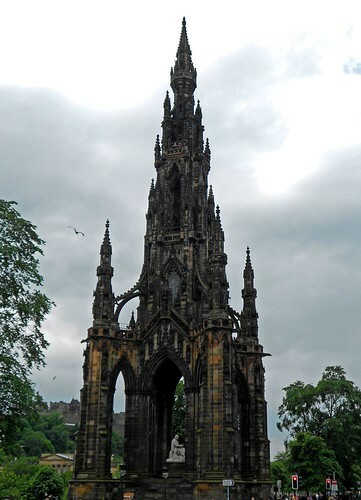 With the second reason in mind, we booked a 2-day hop-on-hop-off bus tour of Edinburgh which included admission to HMY Britannia, the Edinburgh castle, and the Holyrood Palace. Rowan wanted to see HMY Britannia, so we took the bus tour that tooks us to the yacht. That tour provided recorded commentary, but we were introduced to many parts of Edinburgh and learned the origin of the rhyme "Georgie Porgie". 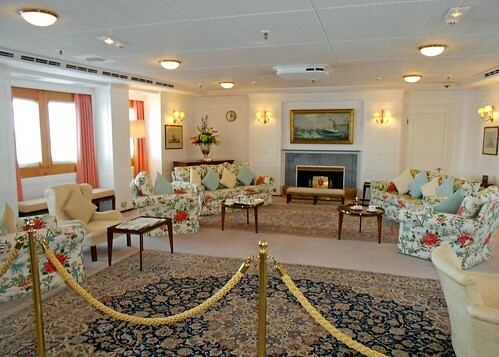 We spent quite a bit of time on HMY Britannia (the Queen's yacht, retired in 1997), and one of the things that struck me was how understated the decor was. The Queen had a hand in decorating the royal area of the yacht, and didn't want it fussy, fluffy, and overdone. She opted for a very simple, light-coloured decor. Another thing that struck me here, as it has on other ships I've toured, is how cramped the crew quarters are. What attracts people to choose a life working on a ship? The living and working conditions just do not seem appealing to me. Maybe the fact that I get quite seasick also makes it difficult for me to see the appeal of living and working on a ship. It was quite interesting to tour the yacht. We found a nice little Italian place for dinner - takeaway. I had one of my favourites: a huge baked potato with cheese, tuna, and onion. 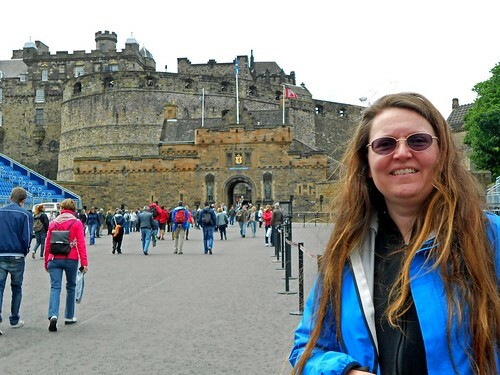 Sunday 15 July - Today we decided to do the bus tour that took us to the Edinburgh castle and then tour the castle. That took us all afternoon and was quite interesting. I've seen castles before and there is always just a little bit of disappointment. As a child, I imaged castles to be magnificant, wonderful, luxurious, warm, comfortable places. But they just aren't. They can be quite magnificant, and they are enormous. Some of the rooms are huge. But they tend to be quite cold and not very comfortable-looking. The history of these places is the most interesting part. It's fascinating to think of the events that took place there over the centuries. In this case, Mary Queen of Scots gave birth to a son named James, who became the King of England, here in this castle. About Mary Queen of Scots, she was apparently quite the imposing woman standing at about 6 feet tall with bright red hair. In that day and age, a woman 6 feet tall would have been immense. As we left, Rowan mentioned that one thing he would have liked to see more of is the contruction of the castle. How was it built? Who built it? And what is the significance of the name "Bruce"? We noticed various kings with "nicknames" ... William the Lion, Malcolm the Maiden, etc., and Robert the Bruce. We returned to the Italian place, and I had the baked potato again ... it's just that good. 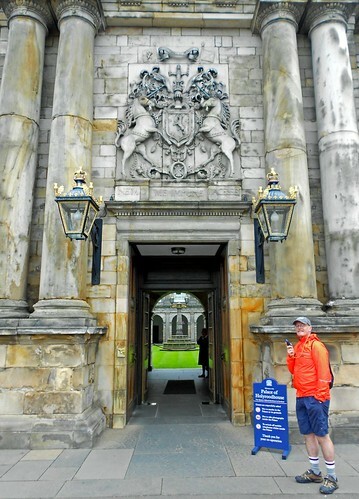 Monday 16 July - Today we did the third day of our bus tour which took us to the Holyrood Palace. The Holyrood Palace is a lot more like what I expected (as a child) castles would be like. It is lavishly decorated, with wood panelling on the walls and tapestries and rugs, etc. etc. The tour takes you through from the entry, up the grand staircase, and through a series of rooms which take you closer and closer to the inner rooms where only a select few could meet with royalty on a more one-on-one level. The second or third room was the throne room ... the most inner room was the king's bedroom. Apparently hardly anyone ever slept there, but I found it interesting that the bedroom (rather than an office) was the most inner room, where meetings were held. The fact that a bed was in the room seemed almost symbolic. We returned to the hostel fairly early to rest up for tomorrow. 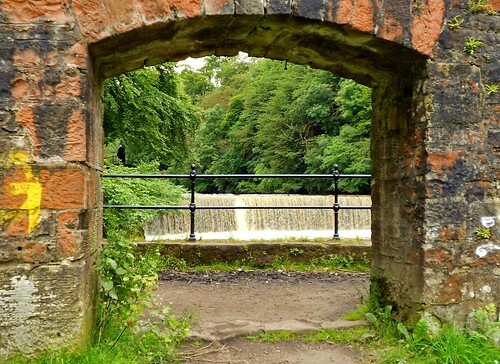 Tuesday 17 July - Off to Linlithgow by bicycle ... the first step on the way to Loch Lomond. Between the two of us, we managed to find our way out of Edinburgh and along the Firth of Fourth, which reminded Rowan very much of the Derwent River area of Tasmania. We were able to follow a combination of roads and cycling paths along there. We stopped for a little bit to eat and drink at an old mill and then visited the waterfall that was part of the mill. I could hear it from a distance, but didn't think it would be as big as it was. It was actually quite impressive. The route was the most hilly route we've done in a long time. It wasn't really very hilly, but I struggled with it and started feeling tired climbing with the loaded touring bicycle. I'm a bit out of shape. We arrived in Linlithgow relatively early and started looking for a campground in our brochure, but had a great deal of difficulty finding it. We ended up in the next town, and when Rowan asked about it at a post office, we were told to return the way we had come. When we cycled back, that's when we could see all the signs for the campground. There weren't many signs coming the other way ... easy to miss from the Edinburgh direction. By the time we got back into Linlithgow, the rain had started and we had discovered that the campground was on top of a hill some distance south of town ... so, we decided to stay at a hotel in town. Fortunately, we were able to find a lovely pub with a warm, dry, comfortable room available for a reasonable price. A lovely pub that served a good dinner as well. We tried haggis tonight at dinner in the pub. Rowan ordered chicken on a bed of haggis, and I tried a tiny little taste of it. It tastes like turkey stuffing. I'm not sure I would go out of my way to order it at dinner, but it isn't as bad as I thought it might be. Because we were a bit frustrated with the road congestion and traffic in the area, and figured there would be a lot more on our way past Stirling, we discussed alternate plans in the evening. Finally, we decided to take the train to Loch Lomond, and then cycle in that area. We really wanted to see several areas of Scotland, not just the area around Edinburgh. Wednesday 18 July - It was bucketing down when we got up in the morning, and we debated about staying in Linlithgow another day, but the pub didn't have a room for that night, so we had to go. In hindsight, it was probably a good thing. We had been advised that there was a nice canal path all the way to Falkirk, so we decided to cycle to Falkirk on the canal path. The plan was that we would catch the train in Falkirk. It was a nice path for the first couple hundred metres, and then it started to narrow, and narrow ... and narrow. And it was wet and muddy with the pouring rain. So, we decided to turn around, return to Linlithgow, and catch the train there. A paved trail might have been all right, even in the pouring rain, but a dirt/mud trail in pouring rain with loaded touring bicycles just wasn't something we wanted to do. For quite a reasonable sum, we were on the train to Balloch on Loch Lomond. The first train to Glasgow was great. It had a place for bicycles and we were able to sit comfortably. We also chatted with a well-travelled lady sitting opposite us. The next train was a bit more challenging because it didn't have a bicycle area, but the conductor was really good and helped us get settled. 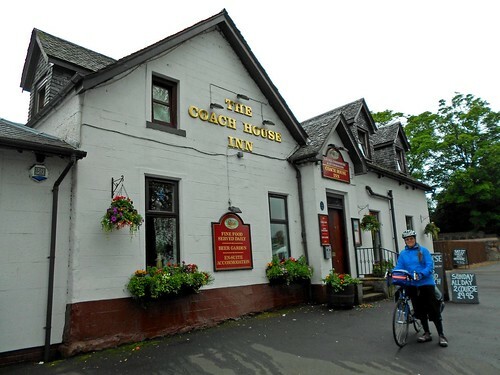 When we got off the train in Balloch, we spotted the information centre, collected some information about the cycling in the area, and some accommodation information, and then made some selections to check. We did think about camping, but the rain continued and it was quite chilly, and we thought we'd prefer to stay inside. Our first selection would have cost quite a bit of money, but we found a nice, quiet, clean, comfortable little B&B for a good price. Believe it or not, it's my first time staying in a B&B. Lots of "firsts" on this trip. Haggis yesterday ... B&B today. Then we went for a decent walk around town. On the way, we stopped in at an outdoor store and I purchased a pair of rain pants. I hadn't brought any with me, but it seemed that they might be a necessary bit of equipment in this part of the world. I got quite wet from the rain in the morning, just in the little bit of riding we did. 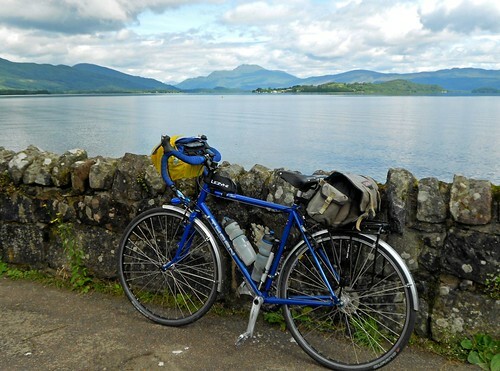 Thursday 19 July - After a good breakfast, we decided to tackle the West Loch Lemond trail between Balloch and Tarbet. We have decided to stay in this area for a few days and do a hub-and-spoke tour in order to see the sights. It's a good route, very scenic in many places. The trail is paved the whole way and makes use of cycling paths and quiet roads. I prefered the quiet roads. The cycling paths were generally good, but in places they were a bit rough and narrow. After cycling Japan's cycling paths, we got a bit spoiled. We stopped at Luss for ice cream, and at Tarbet for more ice cream, and a few snacks along the way. 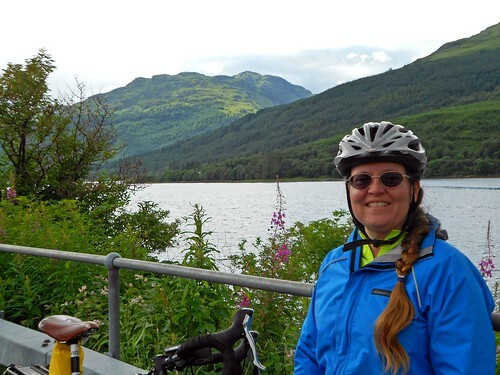 At Tarbet we decided to cycle to Arrochar to see an arm of the Atlantic Ocean. That was a good decision ... the mountains there were quite dramatic. It is a beautiful area. It was a really good ride, and the longest we've done on this tour so far. There was a Doune hill somewhere along the way, and I wanted to take a photo of it for Rowan's sister. But there was nothing to indicate which hill it was, and there were a lot of hills around. And the weather today ... the sun actually made an appearance! It has been raining an incredible amount in the UK, much more than usual, causing flooding and all sorts of problems. It was pouring rain and quite chilly yesterday, but today we had a few small showers, but the sun came out in between. Friday 20 July - Today we visited the local castle, just up the road from where we were staying. In the past, people were allowed in to look around but they must be doing repairs because it is shut. However, there is a beautiful view over Loch Lomond from the outside. We then cycled to a neighbouring town to visit a maritime museum featuring a Denny Tank. I think it was the most interesting maritime museum I've seen because it dealt with drafting and building models of boats and testing them in the process of producing full-sized boats. The testing tank was almost 130 years old ... they've been using that technology for 130 years. The trail is quite nice, and quite a mixture of areas. For the most part it follows the river which is really nice. But some of it is rather industrial, and yet, there is a section that goes right through a cattle pasture. You've got to stop and open gates on either side of the pasture, and you cycle right past grazing cattle. We've eaten at a different place each evening in Balloch, and this evening we went for fish and chips. Very nice. Saturday 21 July - We cycled 40 km ... but didn't get very far today. Like a hamster on a wheel. We had a plan, but it didn't work because we forgot to book the bicycles on the train. At this time of year, you've got to book your bicycles on the train or there's just not room for them. And you've got to be flexible with your plans. You might not be able to travel by train on the day you hoped. So, we were up early and off to the train station to take a small train to the next town up the road. That was all right because the early morning train was practically empty, but we couldn't transfer to the next train from there. After much deliberation we decided to book the ticket for the next day (tomorrow) and then cycle to a town we hadn't been to, but where we could catch the train. I didn't want to cycle the main highway, so first we cycled back to Balloch where we started, and then on to the other town, up and over a small range. Some good views but a lot more climbing than I'd hoped for. And then there was a long, long descent into the town. Before we got very far into the town limits, I felt uncomfortable. I feel that way in some places every now and then ... like I just want to leave as quickly as possible. I felt that way to some extend in London this time. I've been there before, and have felt reasonably comfortable, but this time I just got a bit of a bad vibe there. Perhaps it was all the Olympics prep and busyness going on. This town was not at all what I expected, and I felt quite a bad vibe there. We made some inquiries about places to stay, but it seemed that everything was booked solid. In fact, we were informed that everything within 12 miles was booked. So, with hardly a second thought, we decided to cycle back to the town where we bought the train tickets, but this time we would cycle the main highway rather than back up and over the range. Round and round in circles. I've complained some years, in some places I've lived, that we're not experiencing a summer ... that we've missed out on summer because of the cool, rainy weather. Well, those summers have nothing on Scotland this year! We've been lucky to get highs in the mid-teens. Today started sunny, but quite chilly ... then a system moved in which turned it rainy and cool, and very chilly. I was freezing most of the day. We've been wanting to camp some of the time, but it has just been that chilly and wet we haven't. Fortunately we have been finding relatively reasonably priced places along the way, and hopefully we'll be able to start camping when we get to mainland Europe. 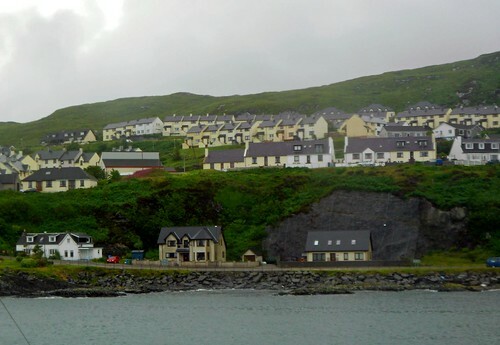 Sunday 22 July - Well, we got where we were going ... to Mallaig. And we're in a B&B, while the wind howls and rain pours. It's rather nasty out there. We saw a campground, but opted to stay inside where it is warm and dry instead. The room we're in reminds me very much of my Grandmother's previous house ... both the room, and the sloped garden in the back. It's sort of hard to put my finger on exactly what it is about the room that reminds me of my Grandmother's place. If you saw a photo you'd probably think it's not at all like any room in her previous house, but there is just something in the window placement overlooking the garden, and the dresser at the end of the room, and the names and pictures of all sorts of plants on the wallpaper, remniscent of a certain blanket ... and the smell. It smells like my Grandmother's place. Amazing how smell can take you back somewhere. Anyway, we cycled uneventfully to the train station and even had time to pick up some goodies for the journey. And we had no trouble at all getting our bicycles onto the train. Amazing what happens when you've got the right tickets. The journey up the west coast to Mallaig is quite pretty. I wish we could have seen it on a day without such low cloud because I think the mountains along way were likely beautiful. What we could see of them was lovely. The route goes through some very remote spots, including a train station that appears to be sitting all by itself in the middle of nowhere. People got off there ... I'm not sure where they would go. There were no houses, shops, or vehicles of any sort around. However, that said, there were a lot of people walking with backpacks everywhere. The train was full of them for much of the trip, and we could see people walking on a track just a little way off from the train. 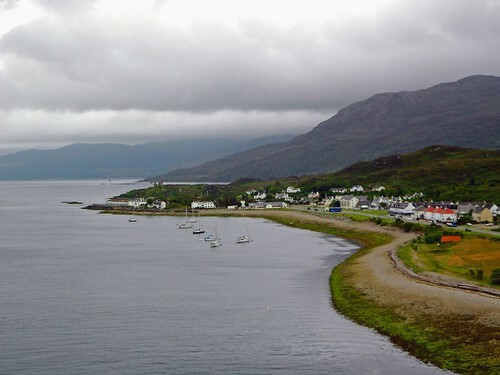 By the time we got to Mallaig, the wind was howling and the rain was coming down. It was very bleak and dismal. We felt quite fortunate to find a nice, warm, comfortable B&B. 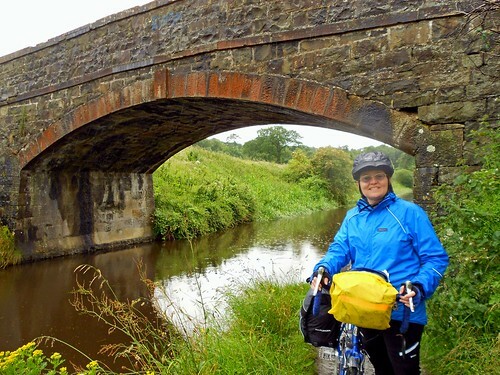 Monday 23 July - OK, here's a little story for you ... Maxine Riggs is a lady who lives in Australia and participates in Audax events. We stayed with her before one event and got to know her a little bit. Today, we were getting things together to take the ferry to Skye when a lady walked past and made a comment about the weather. We both thought we recognised her from somewhere, and then Rowan noticed her bicycle ... an Australian brand. Rowan thought she might be Maxine, and then we were off on the ferry, and we couldn't find out. Later we were eating lunch in Broadford on Skye when the lady cycled past. But we couldn't rush out of the restaurant after her to find out who she was. However a few km out of Broadford, a lady passed us and it was her. Rowan called out, "Is that you Maxine?" and she called back "Yes". He identified who we were and we all came to a screeching halt and had a chat by the side of the road. Fancy meeting someone you know in Australia all the way over on the Isle of Skye in Scotland!! But back to the morning before we left Mallaig. We chatted with the lady who ran the B&B about how quiet it was there. We speculated that it might have something to do with the weather, but she thought it was more likely the economy and that people are staying home rather than travelling. Whichever it is, it's good for us because we are getting onto trains (even if they are the next day) and finding accommodation. I'm not one to book in advance because I don't like planning detailed itineraries. I prefer to make plans as I go, and have the option to say, "Let's stay here another night" or "Let's go north" or "Let's go south" or whatever we feel like, without feeling like we have to get to a certain place because we've booked it. This can, however, create issues if an area is really busy. The ferry trip was good. I was concerned that the wind, which was still blowing quite fiercely, was going to kick up waves, but it was quite a smooth crossing. However, when we arrivd, it was pouring rain and quite cool. Skye was living up to my impressions! I had purchased rain pants the other day, and wore them all day today. I'm glad I got them or I would have been very uncomfortable. Everything seemed to stand up to the rain all right, but I was glad when it gradually eased up and finally stopped shortly after lunch. We lingered over lunch to dry out and get warmed up. 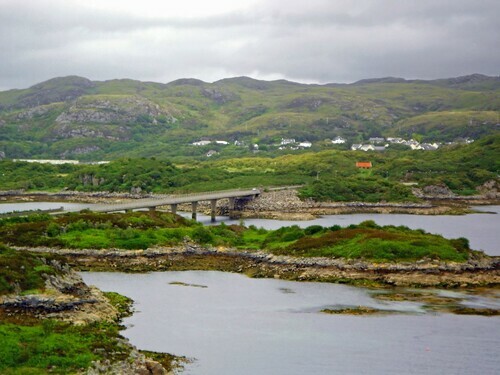 Once we were back on the road again, it didn't take long to reach the huge bridge which connects the Isle of Skye to Kyle of Lochalsh ... the Skye Bridge. We were able to book both seats and places for our bicycles on a train for tomorrow to Inverness, and then we stopped by the Information Centre to check on accommodation. While there, a man called Brian stopped by to chat with us about our bicycles and travels. It was good to talk to someone who cycles as well. This is one of the things we enjoy about touring by bicycle (and a variety of methods of transportation) ... we get to meet and chat with people along the way. And we were able to find a nice B&B for the night. Tuesday 24 July - On the way to the train station, Rowan decided to mail a key back to a place we had stayed a few nights ago. We accidentally took the key with us. Oops. But returning the key wasn't nearly as easy as we had hoped. It took quite a while at the post office to locate an address and postal code. While we were sorting things out at the Post Office, Brian, from yesterday, stopped by again and chatted with us. Among other things, he made the comment that it was a good idea to do what we were doing - to take time off to travel - while we're still young enough to do it, and not wait for retirement. No time like the present. And so, down to the train station and onto the train. When we boarded, we discovered that there was a couple sitting in our seats. When we briefly discussed the situation and they got up to move, I had the distinct impression they were American (accent, dress, etc.). Later, I couldn't help but overhear his answer to the question, "Where are you from?" ... "Canada!" he boomed from halfway down the carriage with a Chicago accent. He must have been asked what Canada was like, and responded loudly with the very vague answer of "Big and empty". And later he was talking about his John Deere tractor with that very distinctly Chicago accent. Canada indeed! Who did he think he was fooling? And why do some Americans try to pass themselves off as Canadians? Why try to hide the country you come from? It was hillarious! Rowan and I represent both Canada and Australia, and so far, we have had good reactions from people who ask us where we're from. Lots of people we've met have friends or relatives in either or both Canada or Australia. The train ride was really nice. Taking the trains has given us the opportunity to see more of Scotland. Scotland is bigger than we imagined, with lots of beautiful scenery. Inverness was quite busy when we arrived. I wasn't expecting it to be quite that busy. We pushed our way through the crowd and managed to find the Information Centre. The Information Centres in Scotland have been very good resources. We've picked up accommodation information, maps, cycling information, and of course information about touristy stuff. In this case, we were provided with a city map and an idea where the B&Bs were located. When we walked into that area, it was definitely the B&B area! About every other house was a B&B ... and many of them had Vacancy signs. It was a tough choice because there were so many! Wednesday 25 July - Today, we did an organised tour of Loch Ness. We've done a few of these here in the UK, and have enjoyed them. In the past I've been a bit sceptical about them, but they do take us places we probably would not have gone otherwise, and the commentary has been quite informative. We've learned things we wouldn't likely have discovered on our own. 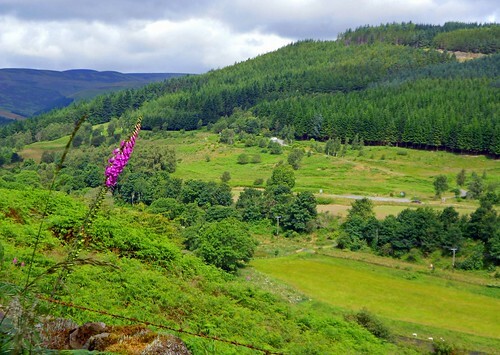 Our tour package included a bus trip down one side of Loch Ness, and the Loch Ness Display which explained some of the research into the possibility of the existence of Nessie, as well as some other interesting features of Loch Ness. 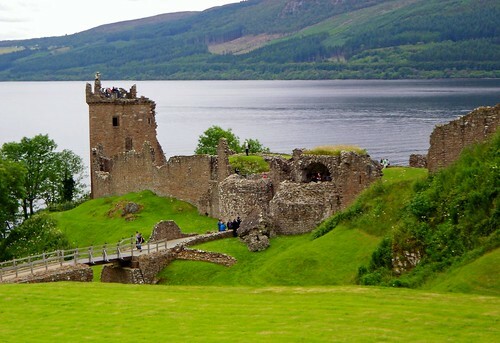 Then we explored the ruins of the Urquhart castle, on the edge of Loch Ness. And finally we cruised up Loch Ness back to Inverness on the Jacobite Queen, an old ferry boat. Our cruise took us up Loch Ness, through another loch, and into a canal where we travelled through a canal lock. I've seen the canal locks in action, but I've never been on board a boat while it happens. I picked up a little Nessie pin at one of the gift shops. I collect little pins to represent the countries I have visited. Oddly, they aren't popular in Hong Kong, Taiwan, or Japan. I wasn't able to find any there, but since I've been in Scotland, I've been able to find one for Scotland, Japan, China (Hong Kong) and a few others. Thursday 26 July - And we are back on the train ... this time to Edinburgh. 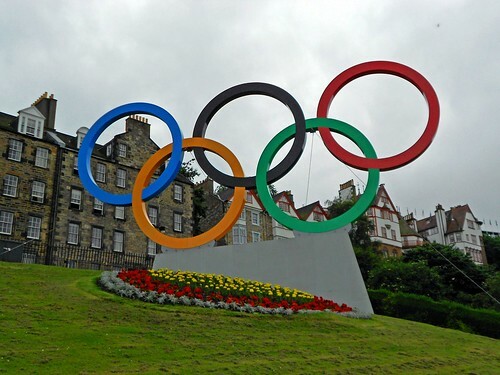 We have been trying to figure out a way to get to mainland Europe, but with the Olympics on in the south, the options are limited. We've seen train trips to towns with ferries cost up and over $600 Australian each. We also have to ensure there is room for the bicycles on the train. So we were quite pleased to be able to book a train for us and the bicycles to Edinburgh for a reasonable price. Again, we were treated to some gorgeous scenery on our way south from Inverness. It would be nice to return here and do some more exploration. We arrived in Edinburgh after 3.5 hour train ride, and we were hungry. So we discovered a Burger King and figured that would do for a quick lunch before starting to cycle. I went in to order a couple double cheeseburger meals and a couple millionaire's shortbread ice creams ... only to discover that a Burger King in the Edinburgh train station had no beef and couldn't sell me double cheeseburgers, and had no ice cream so couldn't sell me the millionaire shortbread ice creams!! A Burger King with no beef and no ice cream???? Just outside the Edinburgh Waverley train station is the Information Centre where we were able to get a Coast and Castles cycling route map. There's also a Coast and Castles cycling route website which provides route information and accommodation information. If you're thinking of cycling between Edinburgh and Newcastle, the map and website are good resources. We still had some day left so we decided to cycle to Dalkeith in order to get a bit of a head start on the route, and that went all right. The route was pretty good, and relatively easy to follow. Of course it poured rain when we arrived in Dalkeith, so we found a hotel. While looking over the map to see where we would go tomorrow, we discovered that the distance between Edinburgh and Newcastle was a lot further than we had anticipated. According to Google, the distance is about 200 km. But according to the map, the distance is 320 km. That was a bit of a surprise! 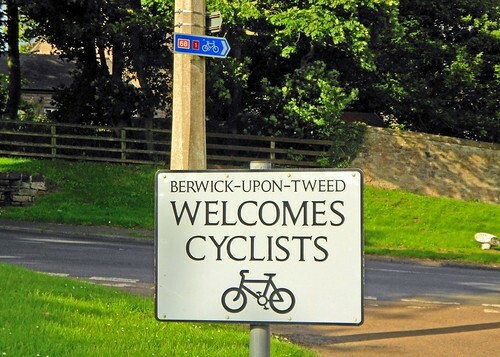 Google does tend to send travellers on the shortest possible route, while routes like the Coast and Castles route send cyclists on quiet roads and routes which may not be the shortest possible. But I'm just not fit enough for 100+ km/day with a loaded touring bicycle over UK hills at this point. So, I think we've come up with a solution that won't involve cycling the whole distance to Newcastle. Friday 27 July - 44.4 km ride today ... mostly uphill against the wind, with areas of rain. Tough day. 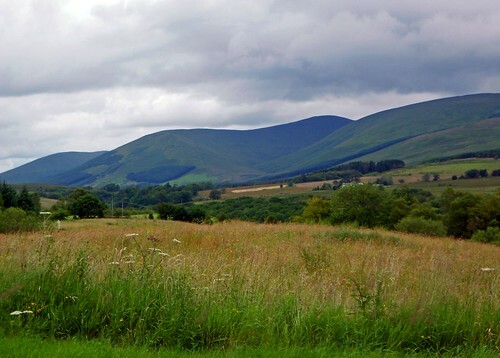 The route from Dalkeith to Innerleithen involves some long climbs. For the most part, the hills aren't overly steep, but they are long and challenging. Adding to the challenge was a stiff headwind. We had been warned that we would be cycling into the prevailing wind, and we certainly were. Another challenge is that there isn't much in the way of services between the two towns. On the map that doesn't look too serious. If it were a flat route, on a windless day, without the panniers, I could cover that distance in a little more than 2 hours. I could be there by lunch. The area reminded me quite a bit of parts of Wales I've seen, very remote and hilly. But with all the climbing, the wind, and the loaded panniers, we didn't get to Innerleithen until late in the afternoon. We were fortunate to get into a really nice B&B with a beautiful view of the valley and town. And we found a good Indian restaurant.I really like the Indian food here. Saturday 28 July - Today's ride was a tough one for me in particular. 60 km with loaded touring bicycles up and over hill after hill after hill. The National Cycle Network does tend to take you off the main road (good) and send you over every hill in the area (not so good). The hills were a bit steeper today (or maybe they just seemed that way), and I did quite a bit of walking. Walking, pushing a loaded touring bicycle up a steep hill may be marginally easier than cycling up the hill, but it isn't easy either and involves other muscles. So I'm getting a good workout these days. But the scenery is beautiful. Scotland really is a very pretty part of the world. This part of the route had a town in the middle where we could get something to eat, and we ate at a little cafe called the Black Cat. And speaking of black cats, there seems to be a lot of them in this area. We've seen several. In one case, we approached a corner where a woman in a car was hastily backing away from the road, struggling with her gears. We turned the corner and there, in the middle of the road, was a black cat. We cycled toward it, and it walked confidently toward us. I was quite surprised. Most of the time when we encounter cats while cycling, they run away. This one did eventually move aside to let us go by, but it didn't seem at all afraid of us. Kelso is a different sort of place ... lots and lots of places for sale and for let, and several places just simply closed. One entire grocery store was shut. The building was for sale, but the way it was locked up gave the impression it had been on the market for a while. Even the streets looked almost deserted, with the exception of one particularly noisy pub. But it could be quite charming. It's a very old looking town full of old buildings and cobblestone streets. We stayed in a B&B on the Tweed River which was built in the mid-1800s which was quite nice. Sunday 29 July - I have never had a candlelight breakfast before. We were served breakfast with a candelabra on the table and classical music in the background. An interesting way to start the day. The terrain was a bit easier today, but I was tired from the last couple days. Today we were right on the Scotland/England border and kept crossing back and forth across the Tweed. I do like cycling the UK countryside. The little roads are great, and the scenery is so pretty. I could spend a lot more time here meandering around the countryside. Today's route also offered us a few opportunities to get food along the way which was helpful. 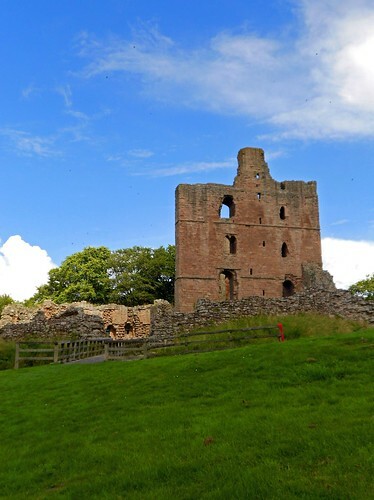 We stopped briefly along the way to have a look at Northam Castle. According to a notice board (of which I have a photo in my Flickr site), Northam Castle features in Sir Walter Scott's poem Marmion. And then we stopped again to have a look at a very wobbly bridge over the river from the England side to the Scotland side. It didn't sway from side to side, it rippled with the vehicles that crossed it, and only one vehicle could cross at a time. It was very strange to watch! A comment about the weather over the last few days ... sun, rain, sun, rain, sun, rain, sun, rain ....... It's really difficult to dress properly. On with the rain jacket, overheat in the rain jacket, off with the rain jacket, get caught in a shower without the rain jacket, on with the rain jacket ... and repeat! So 55.75 km today and we're on the east coast of the UK. Tomorrow is a train day and then a ferry night. 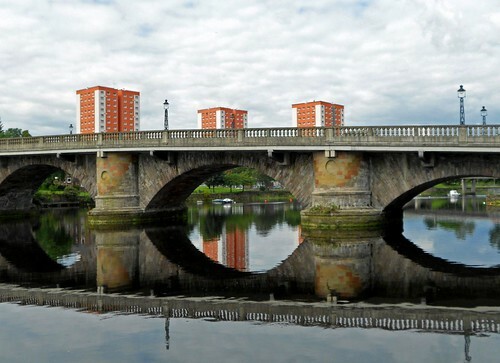 When we arrived in Berwick-Upon-Tweed, we made an interesting discovery. Everything was booked! No Vacancy everywhere. We walked the streets trying this B&B and that Inn ... nothing. Someone told us about a nearby campground, but it sounded like a bit of a ride out of town. However, with no other options presenting themselves, we started to make our way toward the campground. As we rounded a corner, we spotted two Inns which we had not been to yet, and one appeared to have a Vacancy sign in the window. Sure enough, they had one room left! We spent the night in an Inn built in 1685. Upstairs, where the rooms were had been renovated and was quite modern, but on the main floor where the pub was located, still maintained many of the features of the original building, including the very low ceilings. Dinner was interesting. We had not spotted much in the way of restaurants, so we opted to have dinner at the pub. But the menu was rather unusal, not quite what we were used to. I've never looked at a menu and had nothing quite appeal to me. I settled on a cold smoked chicken salad which was quite nice, and a grilled fig and cheese dish. Grilled figs are actually quite good. Monday 30 July - It was a bit of a mad dash to the train. We had travelled further than we thought into town during our search for accommodation. But we made it with a few minutes to spare. The employees at the train stations, and especially on the platforms, have been brilliant. In the past, I haven't made use of their services, and that was a mistake. 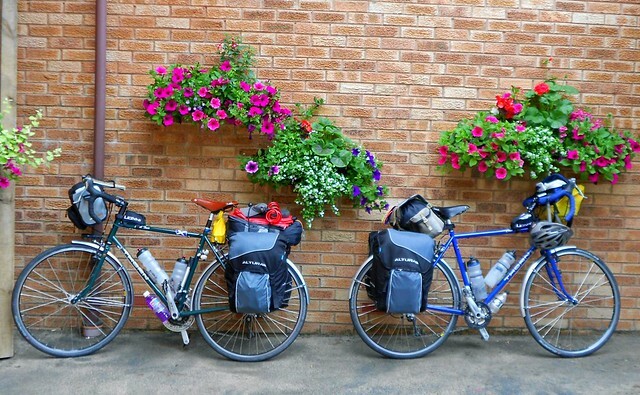 This time we enquire where we should be for the bicycles, and they seem more than happy to get us into the right spots, to assist us with loading the bicycles and our panniers, and to get us settled all in a relaxed way. No panic, no rushing. But of course, in the UK, you need to book your bicycles on the trains. They travel for free, but we have had to book a seat for ourselves and a spot for our bicycles, so everyone is expecting us. If we do not book, there is a good chance we won't be able to travel by train that day. 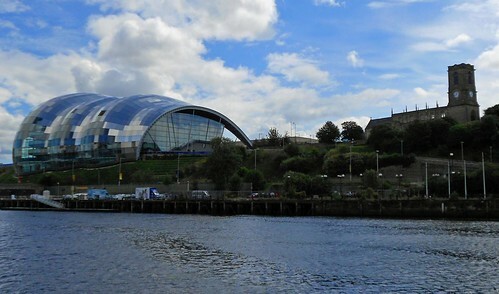 In no time we were in Newcastle and considering options to get to the ferry. As it happens, bicycles are not allowed on the metro in Newcastle. We had been planning to use the metro, but they allow only folding bicycles. So, on to Plan B ... cycling. With the help of a construction worker, we found our way onto the path out to the ferry. The people we have encountered along the way so far have been great. Lots of very helpful people, more than willing to stop and see if we're OK or if we need directions somewhere. I wasn't prepared for another day of cycling, so the ride to the ferry was a little bit slow. Nevertheless, we arrived with lots of time to spare. And then, we were stood in line for about an hour waiting for the cars to be loaded into the bottom of the ferry. It was a bit of a relief to finally get on board and get to our cabin. There have been a number of firsts on this trip, and having a cabin on board a ferry is one of them. I've done 3 overnight ferry trips before, and never had a cabin. We spent the evening wandering around the ship ... I feel better on board a ship when I'm walking. Fortunately it was a very calm crossing. It started to roll a bit around 4 am, but I slept through most of that, and we docked at 10 am. And there we were ... in The Netherlands!